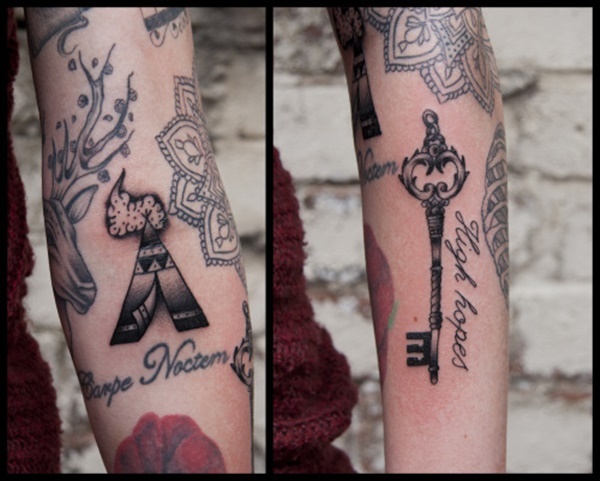 If you’re thinking of inking a key on your skin we offer you 100 mysterious key tattoo designs for your lock. Pick one of them or get inspired by the many displated. 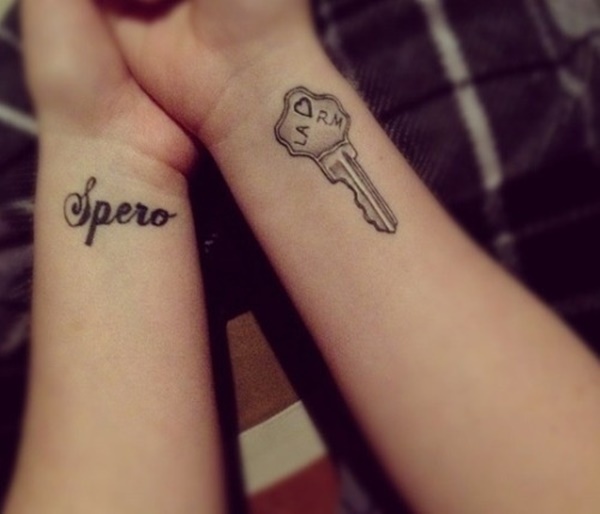 So why would you want a key marked on your skin forever? Let’s analyze the possible meanings behind it for a second. 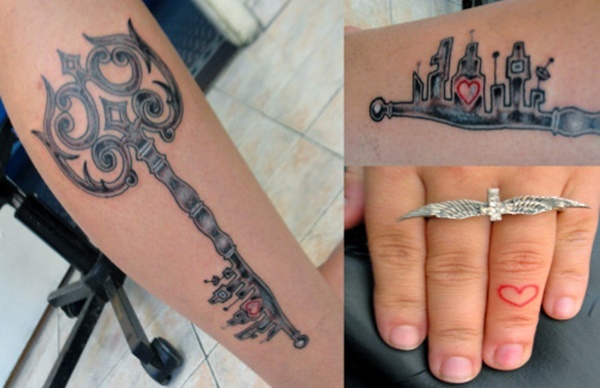 The key is a sign tattoo that can have several symbolic meanings. 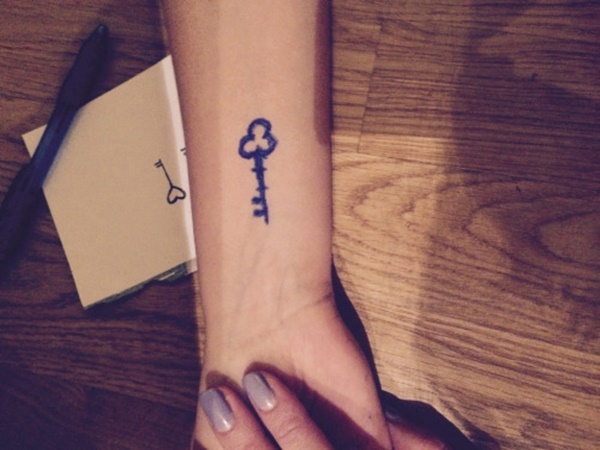 The purpose of a key is to unlock and grant access to something otherwise inaccessible. 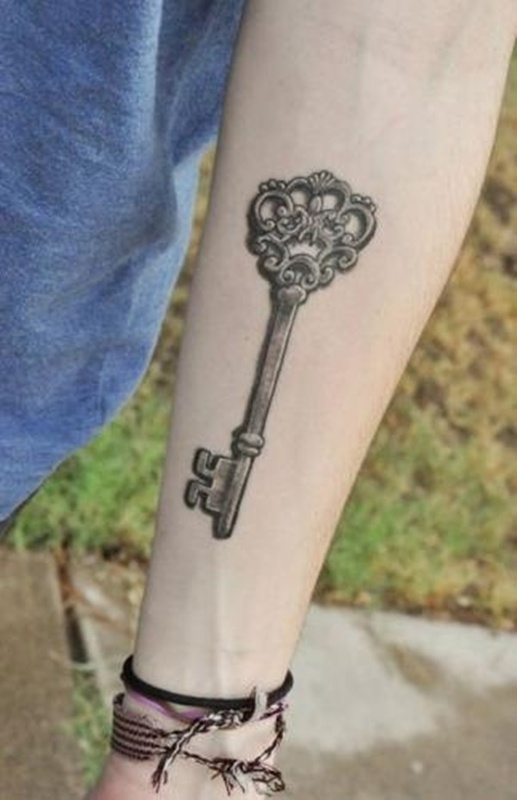 Key tattoos are symbols and metaphors that can have the element of mystery, because we often don’t know what they unlocks and what is behind the door. This design can be embellished in many ways – floral styles, colors, ribbons, hearts, skulls, filigrees, etc. Placement is always up to the client’s choice. Popular areas are chest, shoulders, hands, arms, rib cage, fingers, ankles or the back of the neck. 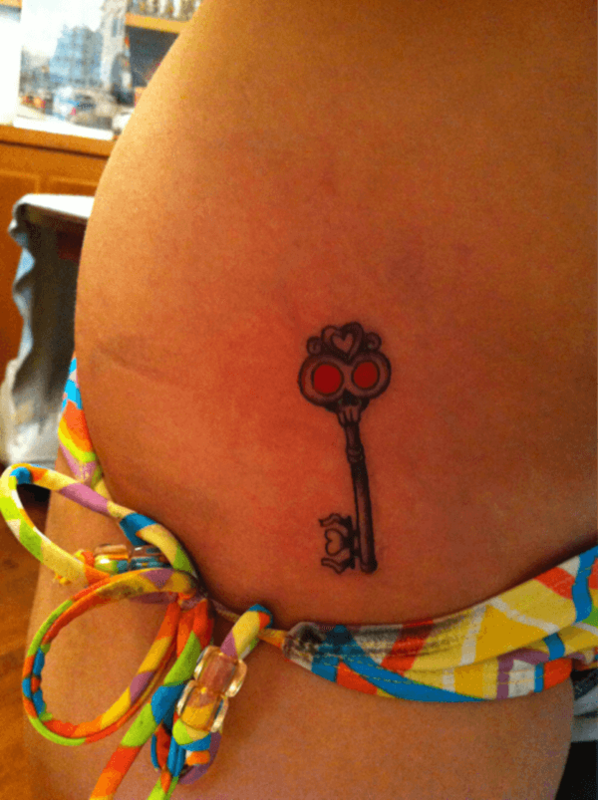 It’s also common for key designs to have letters incorporated, a pair lock on a nearby area, or on the partner’s body. 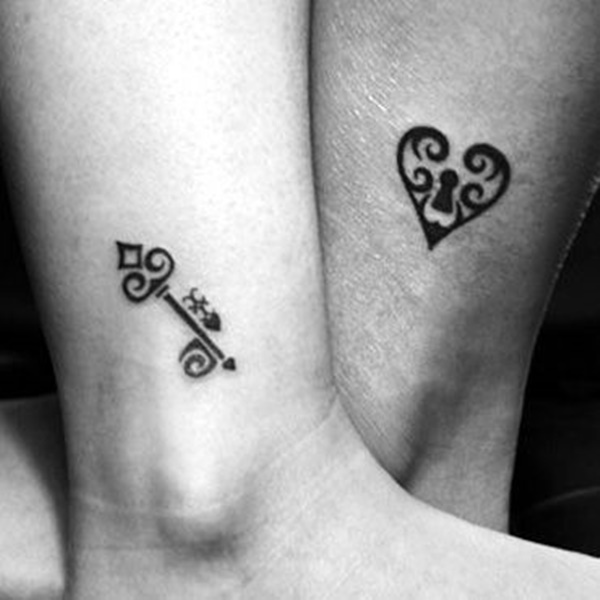 The lock and the key pair is a popular tattoo design on lovers and means wholeness, completion, and the right partner for each other and exclusive devotion. 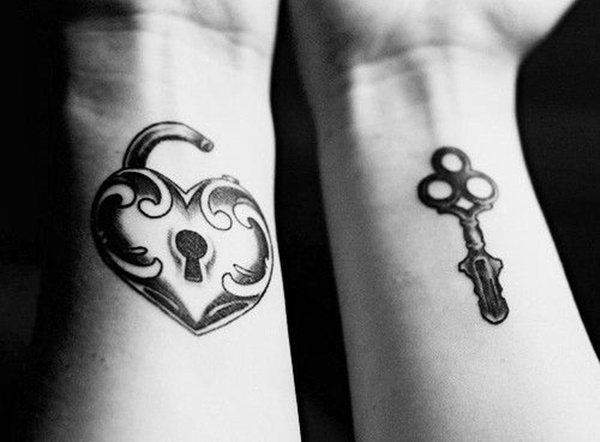 The lock can also have customized shapes – puzzle piece, heart shape, filigrees etc. 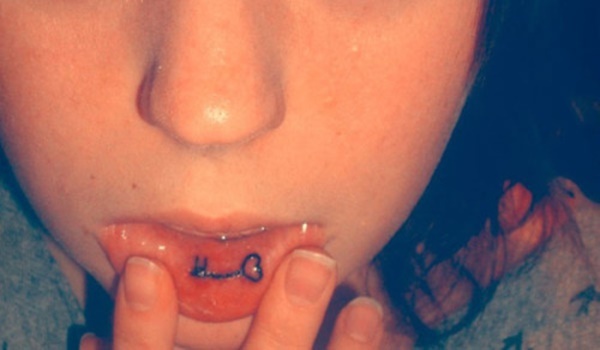 The most discrete area and smallest sized key can be inked inside the bottom of the lip. 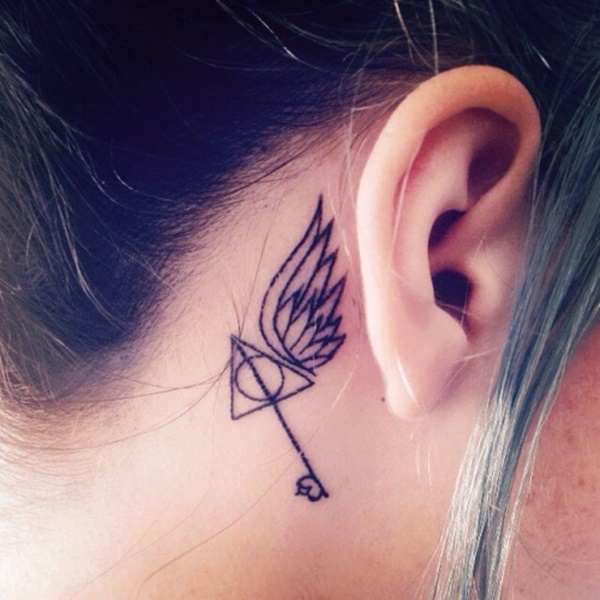 You can ink this tattoo in many styles, colors, and sizes. 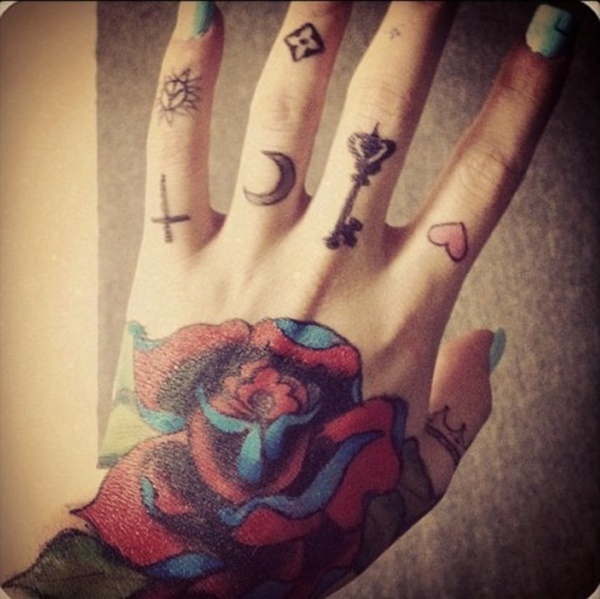 It can stretch along the arm or it can be stenciled on the fingers. You can pick from black and gray, realistic, traditional (bright, vivid and saturated colors, and bold black lines), or maybe you want to approach this concept with the new school style, or just simple line or dot work. 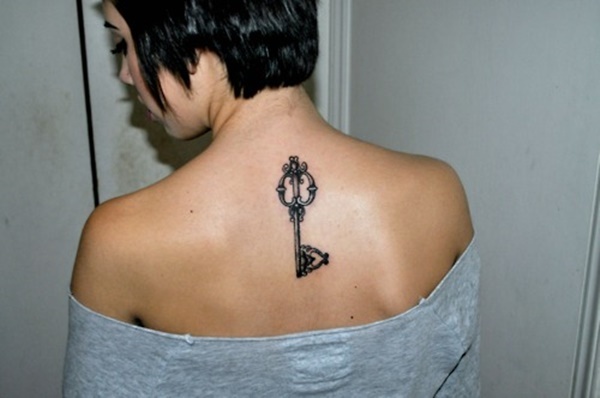 Shoulder tattoos are popular for women. They go great with an elegant dress that leaves the back uncovered. 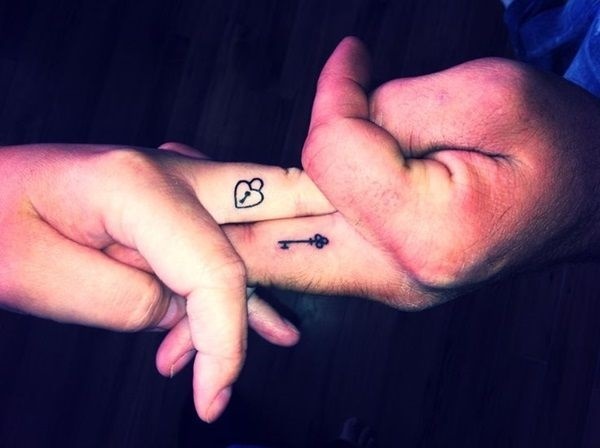 Key and lock pair on lover’s fingers: small and discrete in line work fashion. 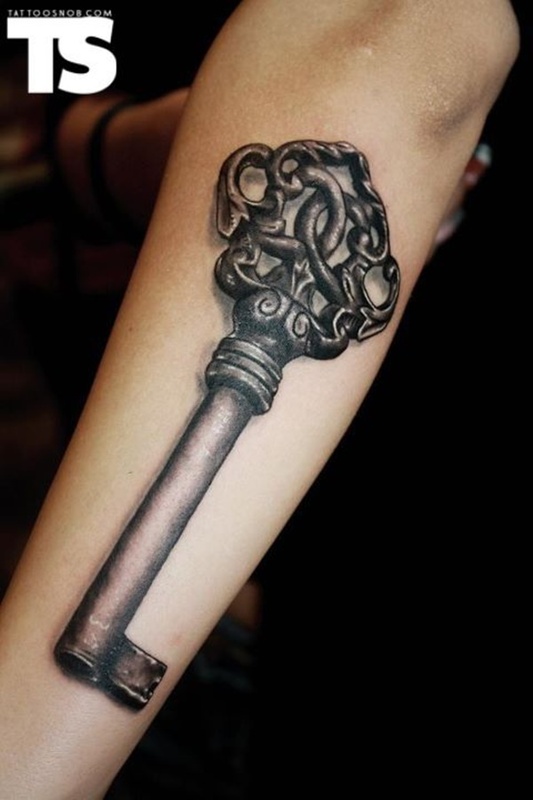 This is a black and gray realistic of an old key with intricate patterns. 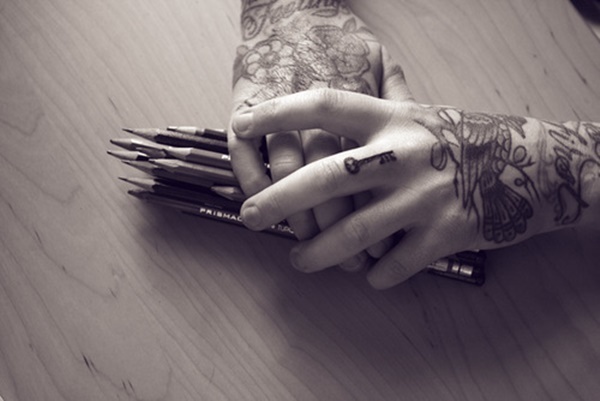 Knuckle ink is considered as a “in your face” message with attitude. 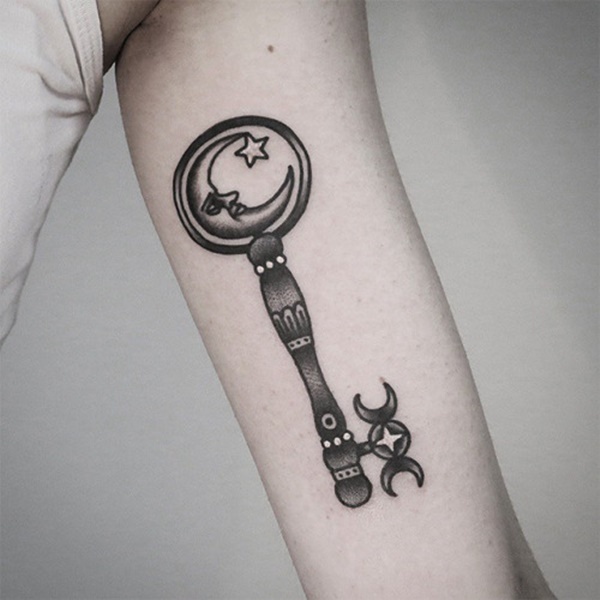 This one depicts various signs and symbols – mysterious indeed. 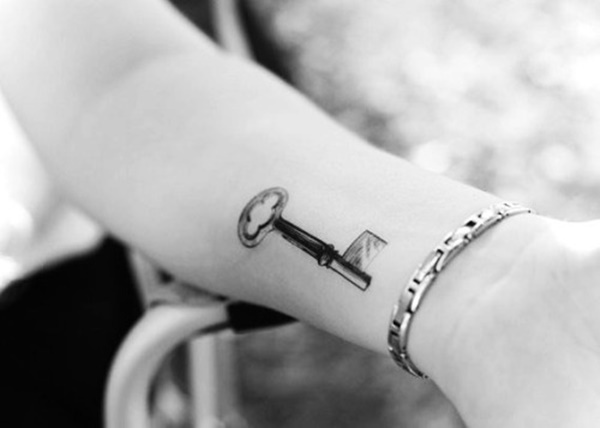 At the end is a key. Could this be a password? 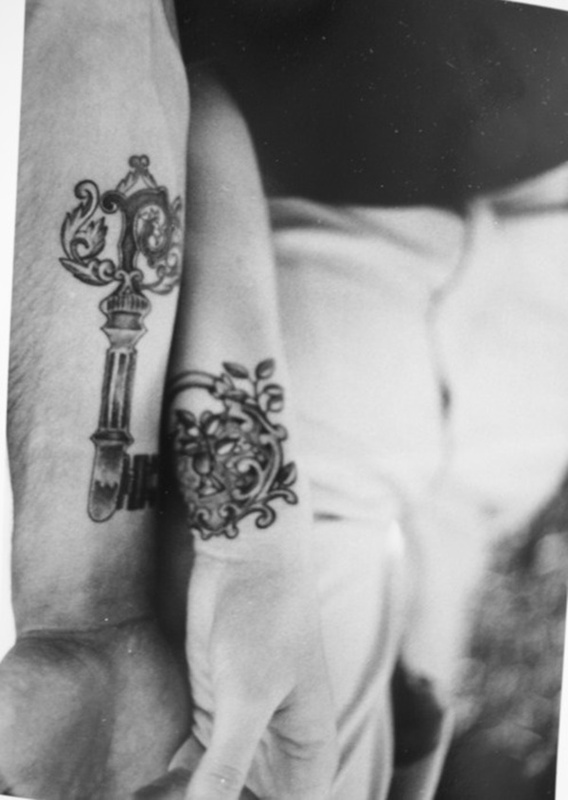 Key to my heart: the classic lock and key pair. 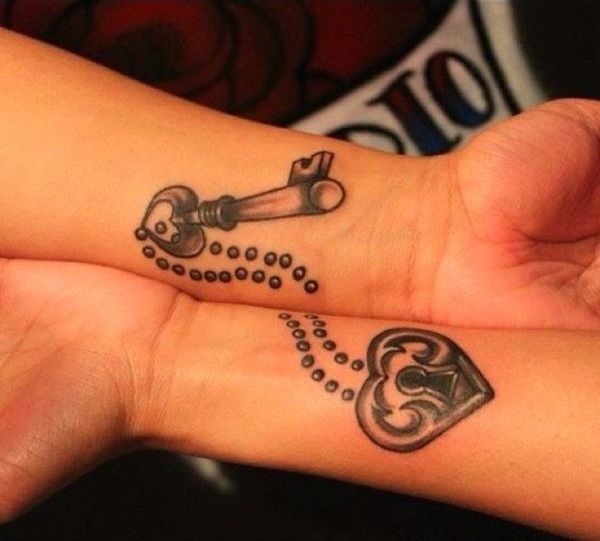 The rosary connects the two elements as a matching set. 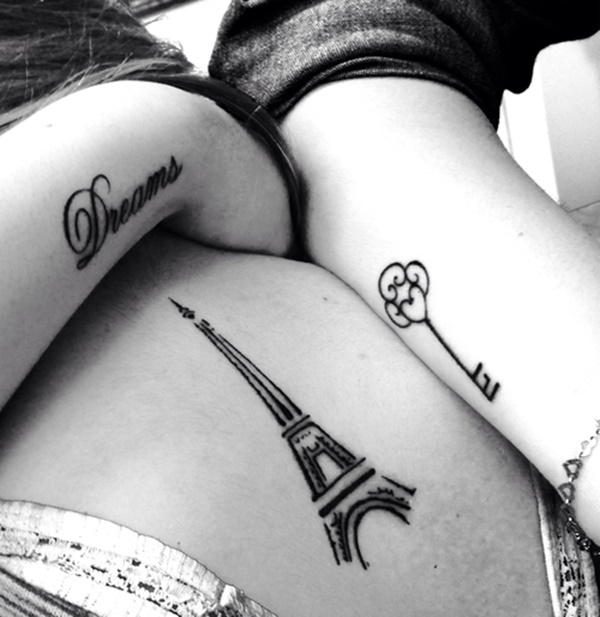 Arm placements with abstract and colored geometrical patterns. Two puzzle pieces with a lock and key inside of them. Soul mates or friends? 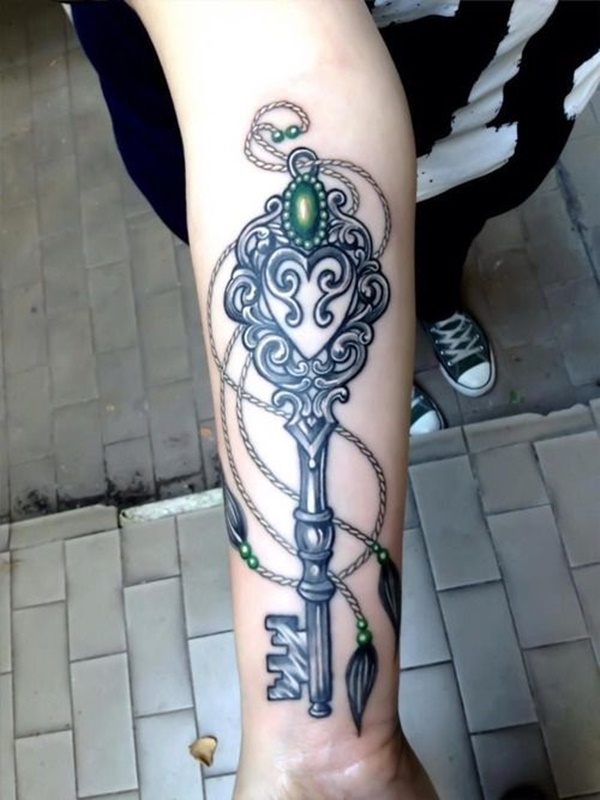 If you already have a lock inked on your skin or your lover has one, and you are looking for a key to match it, the idea is simple: look for a design key that will fit and complement the in style, meaning, and aesthetics. Bellow is an example of that. 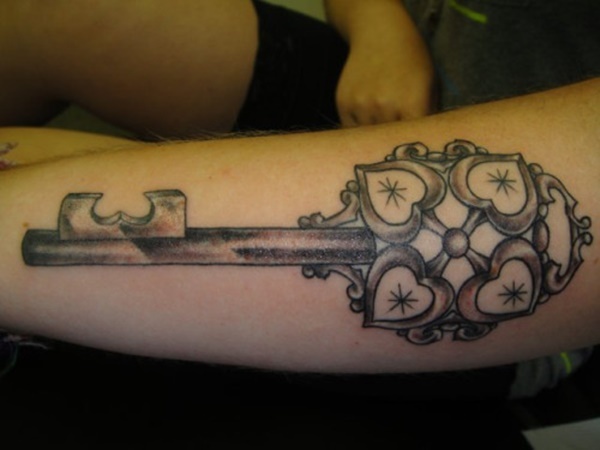 It is best to find an artist that you like and consult with him to create a matching design. 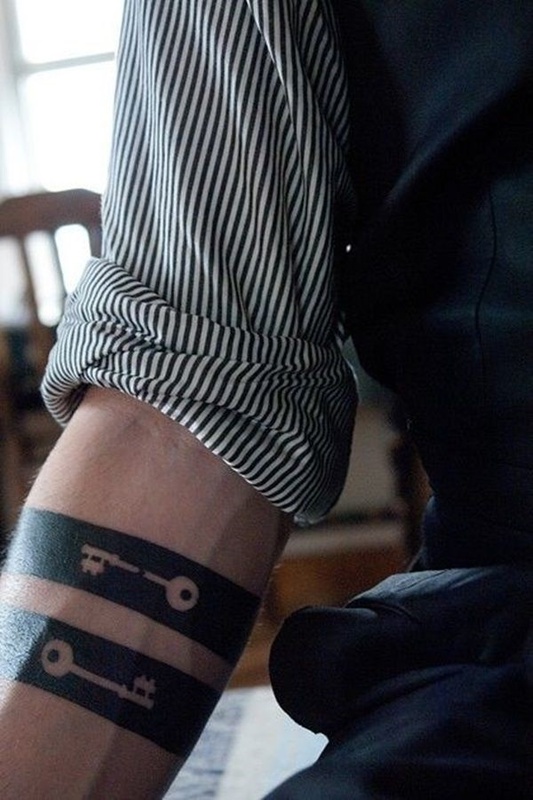 Multiple keys strung on a hand-embellished trinket. Minimalist design and line hatching. 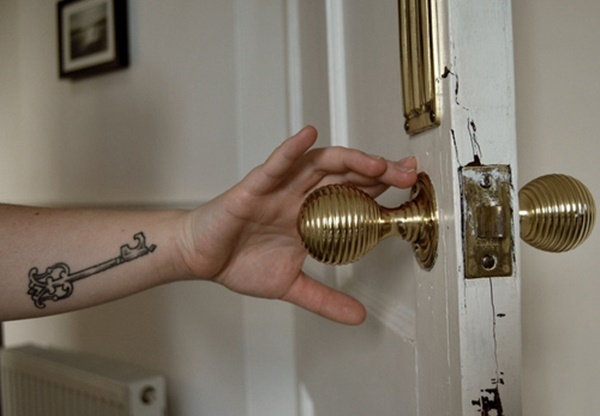 Since there are different unlocking patterns for each, we can assume that each one unlocks a different door. 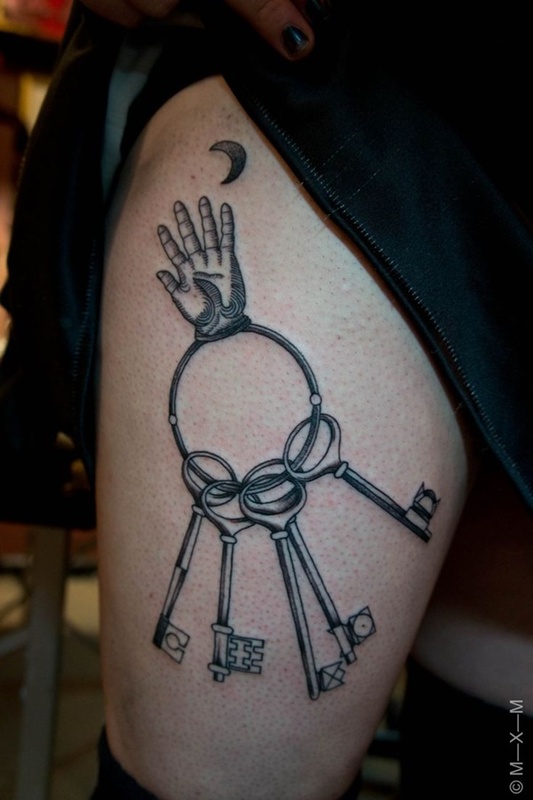 The hand looks like it’s reaching for the moon above. 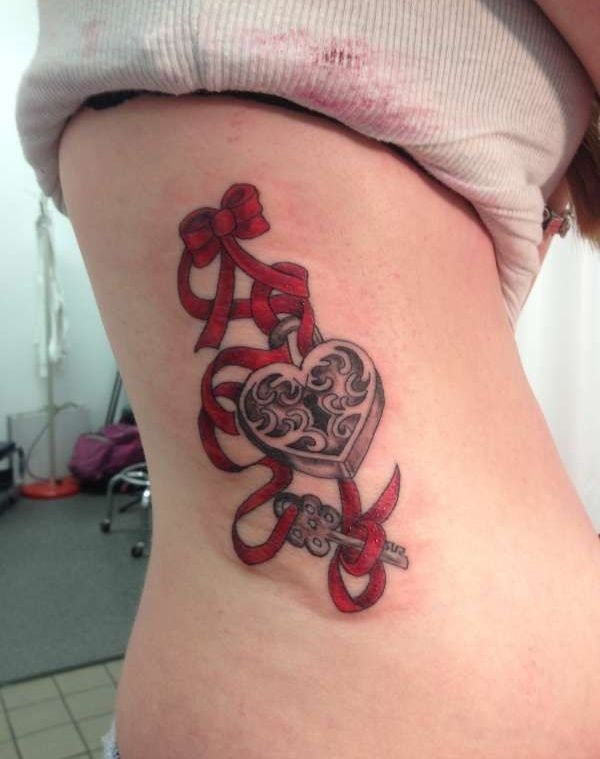 A vivid red ribbon embellishes this tattoo and wraps it like a gift. The red color and the flow makes it very feminine and whimsical. 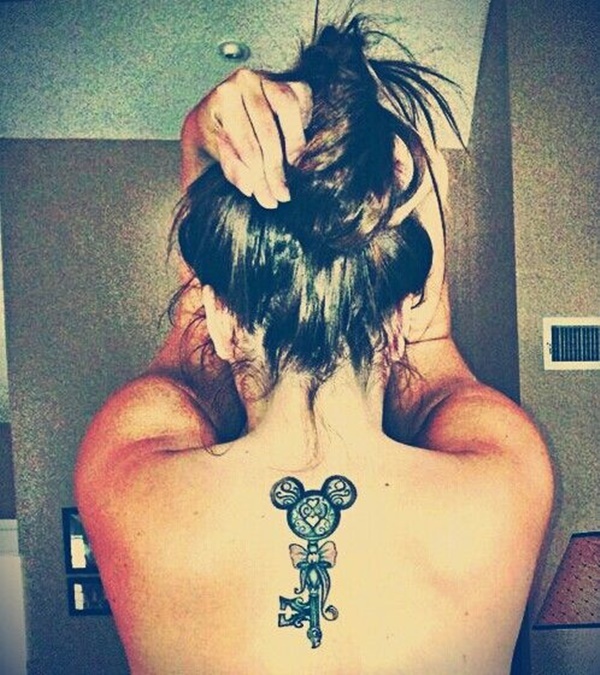 Another whimsical styled tattoo – A Mickey mouse silhouette, flowing lines, and a bow in the middle. Well centered on the superior back side. 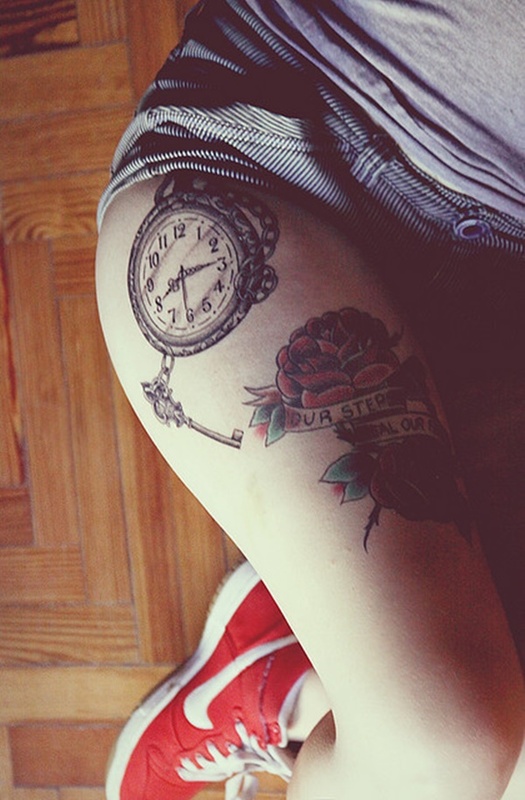 The standard sign tattoo motif with watercolor elements. 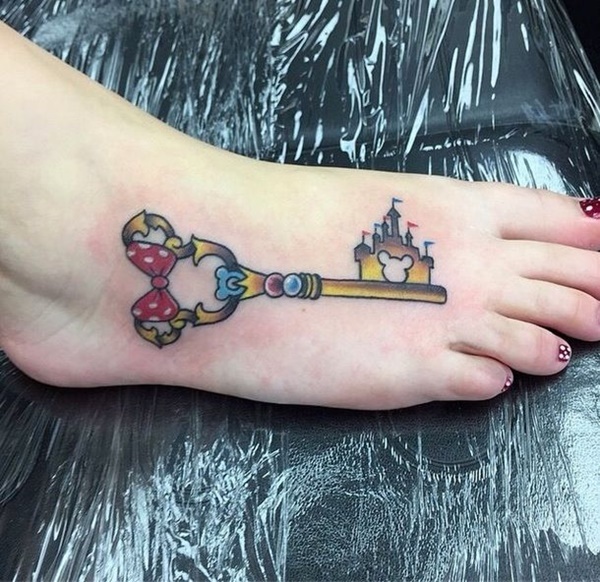 Traditional piece with design elements that allude to Mickey Mouse and Walt Disney. 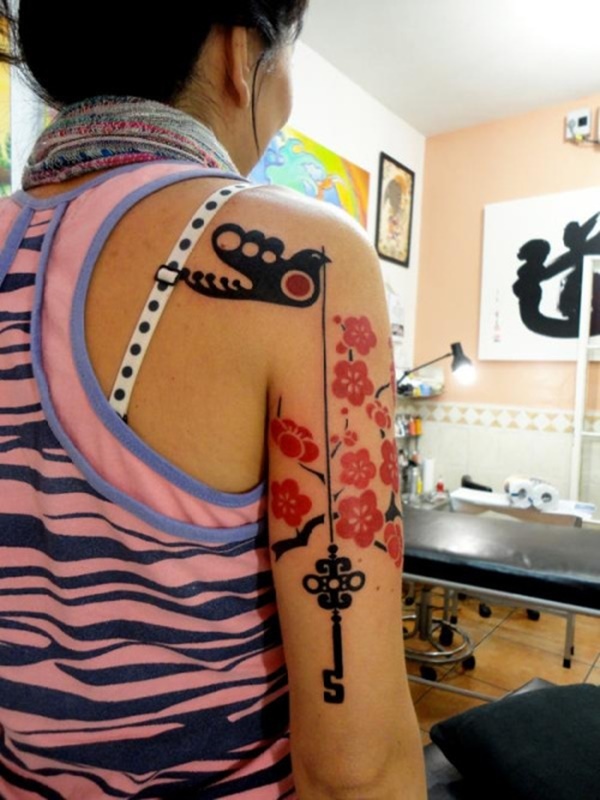 Vivid saturated colors and bold black lining specific to the traditional style. 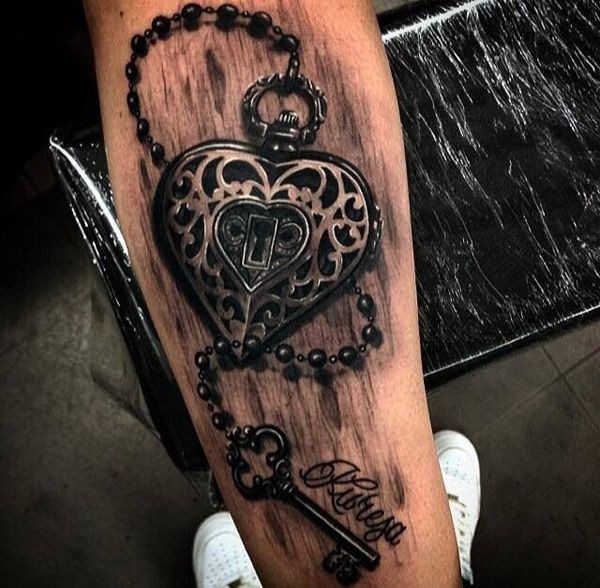 Metal heart case sitting on a wood floor surface: forearm area. Textures of metal and wood rendered successfully in a realistic manner. 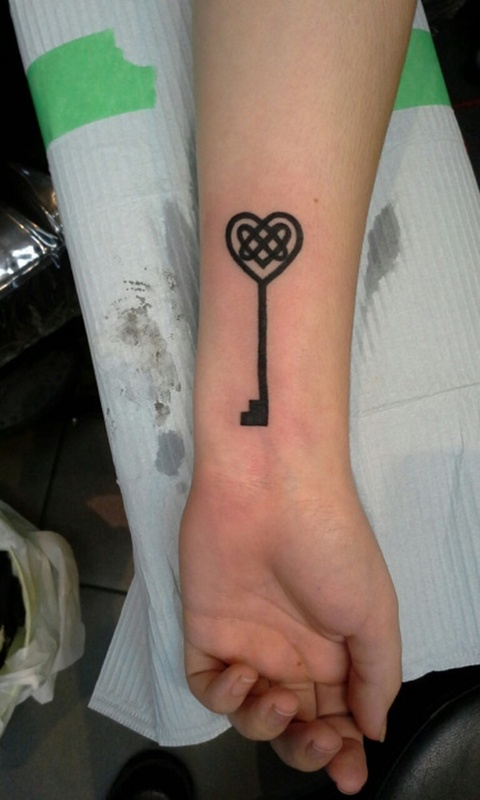 An example of minimalist key and lock tattoo. This piece has very nice flow lines and beautiful filigrees that give it a dynamic undulating motion on the body. The rosary connects the two and give the impression that it’s been thrown into the air and floating. 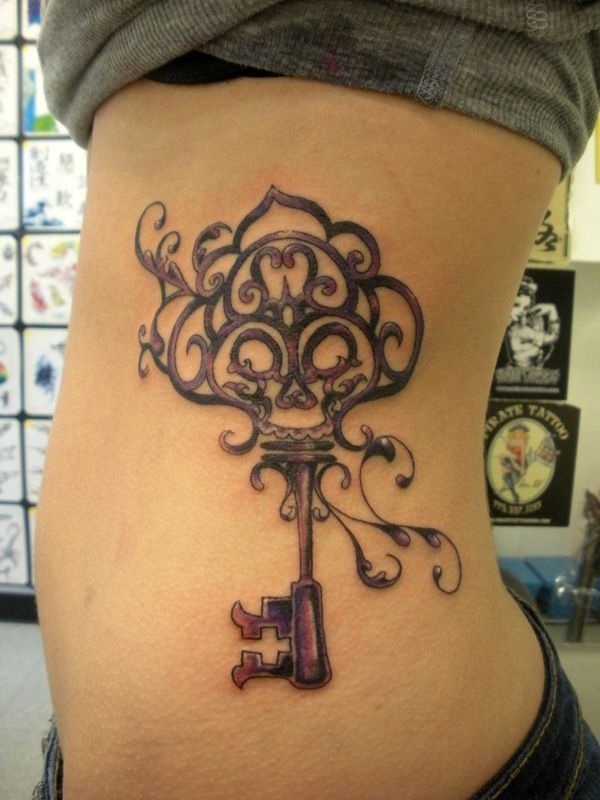 Both the key and lock are beautifully ornamented. The white pops out, giving it shine and a metallic feel. 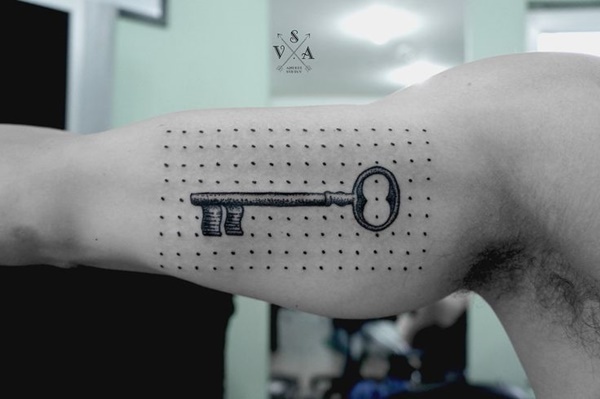 The line patterns go inwardly, drawing the eye to the keyhole, centering and framing it nicely. 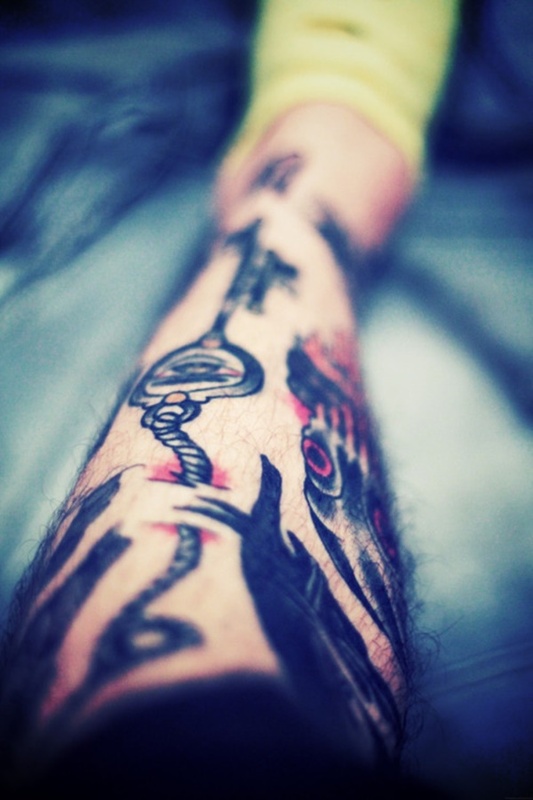 When choosing a design you should also think about the skin area you want it inked. 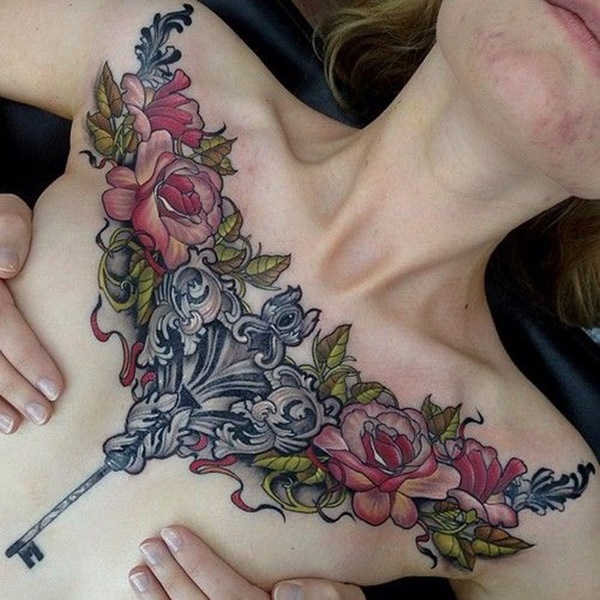 Since body flow is important in skin art, some might fit better on certain areas than others. The canvas of this art is alive and is three dimensional, with volumes and curves. It will never be flat. 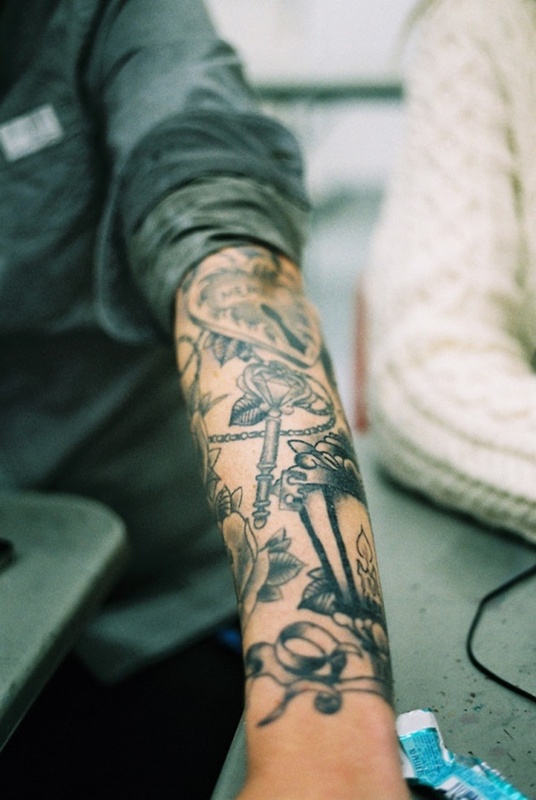 So when tattooing or getting tattooed you have to keep that in mind. You might want to start with something smaller if this is your first one. It will be done faster and there will be less pain involved. 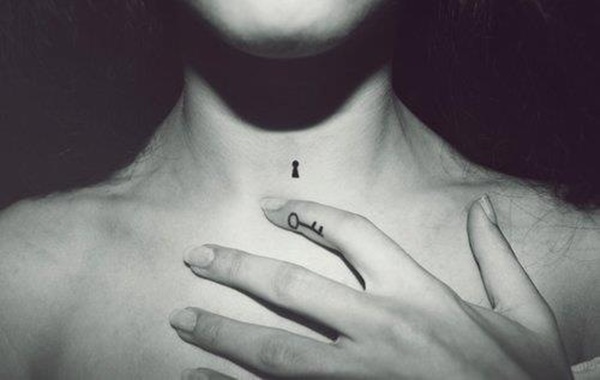 A lock hole built into the skin with golden shiny frames and a dark inside blank space that creates depth, hollowness and enigma. 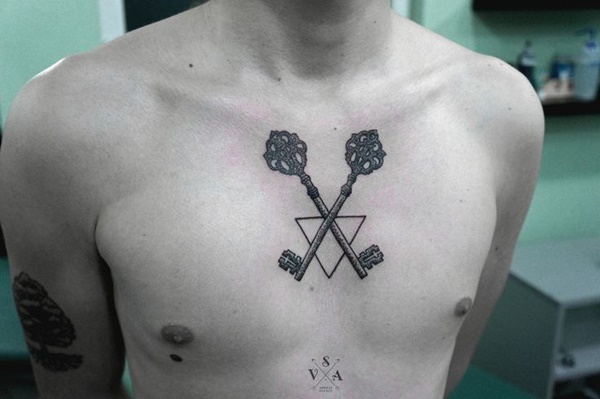 Taking the opposite direction in comparison with the minimal small sign tattoos, this piece is extremely decorated with floral motifs, leaves and filigree patterns. 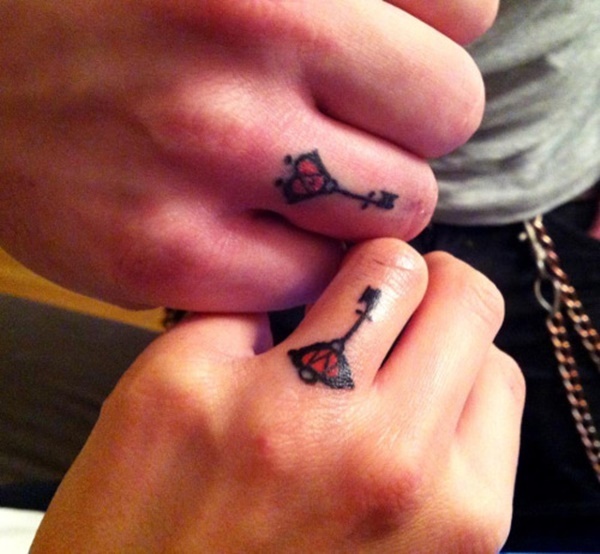 The nuances of lime green and pink attract the eye while making the tattoo more cheerful. Sophisticated designs like this need to have a certain size for all the detail rendering to be possible. More elements means more skin. 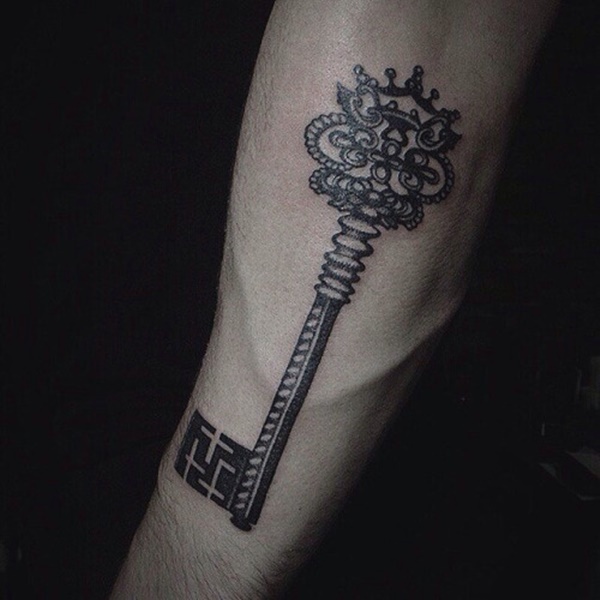 Another baroque key with the typical embellishments and flowing patterns that give its elegance. The shading and the white gives it shiny reflections, while the bold contour lines frame it firmly. The colored top stone and green spots contrast the black and gray well and draw attention to the eye. 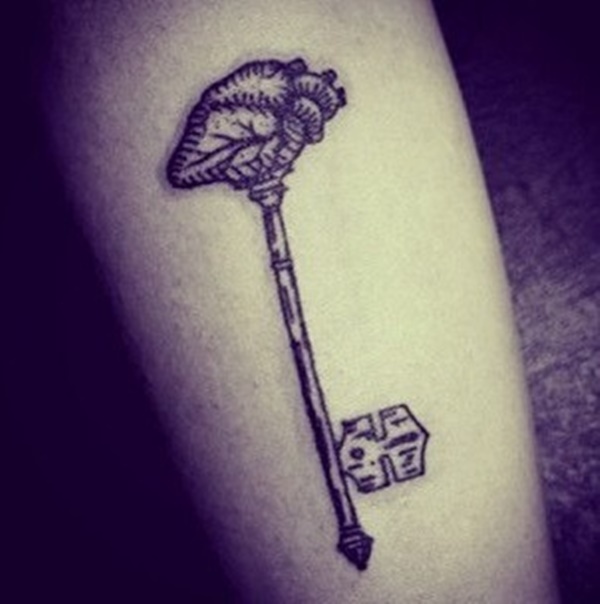 This one looks like a key to a medieval castle door. 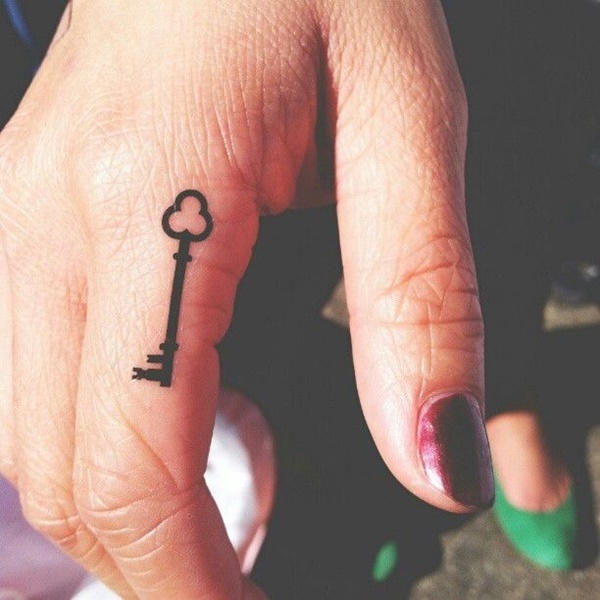 Small minimal design for the finger. 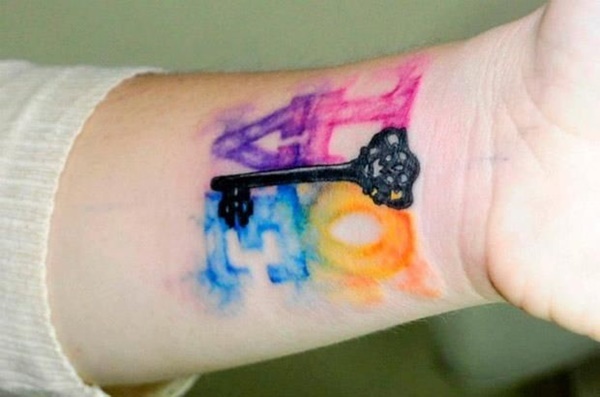 Rainbow spectrum and watercolor style with a black retro key in the middle. 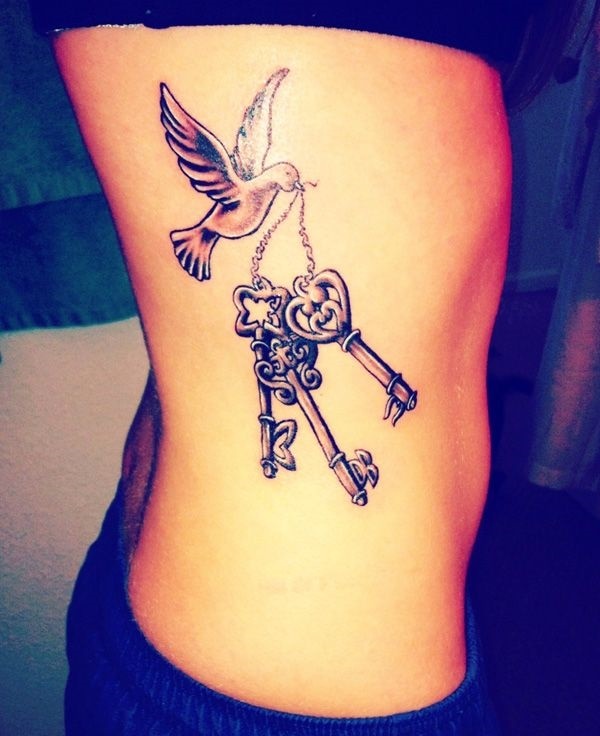 Suggestive picture of a key tattoo and a real door lock. 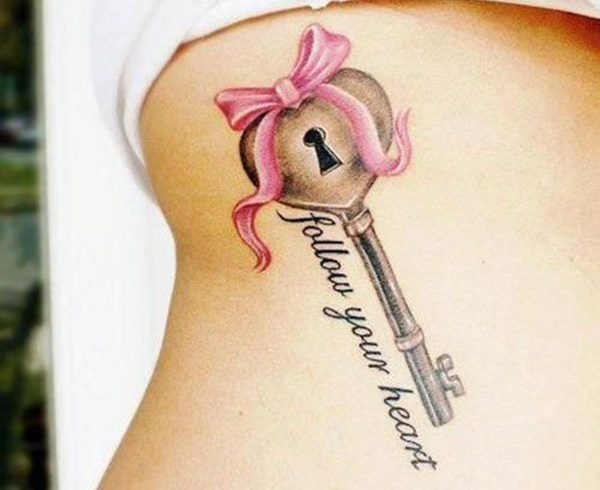 Another key to my heart allusion. 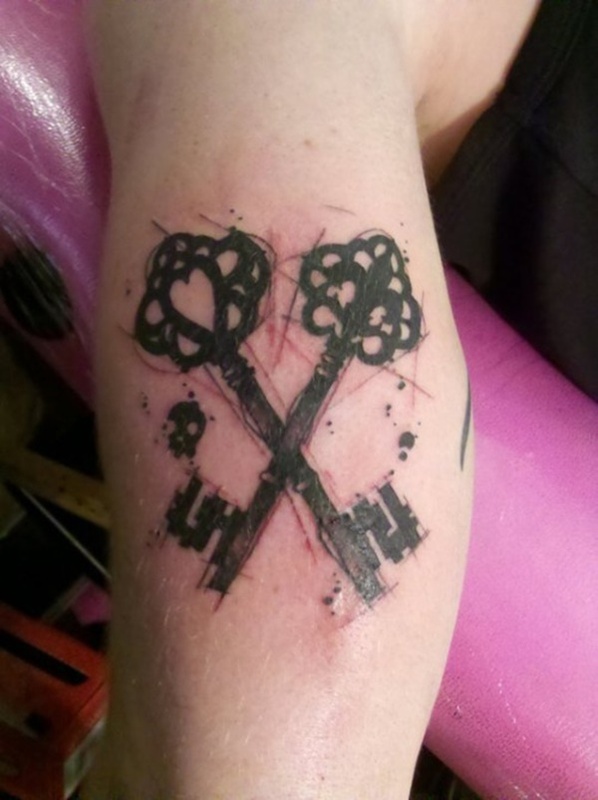 Four spades and a negative heart for as an access code. 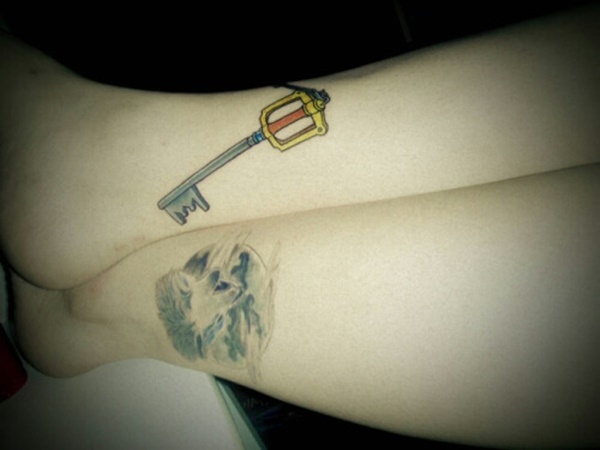 The size and style of this tat make it hard to go unnoticed. The yellow, red and green colors are alive and shiny. 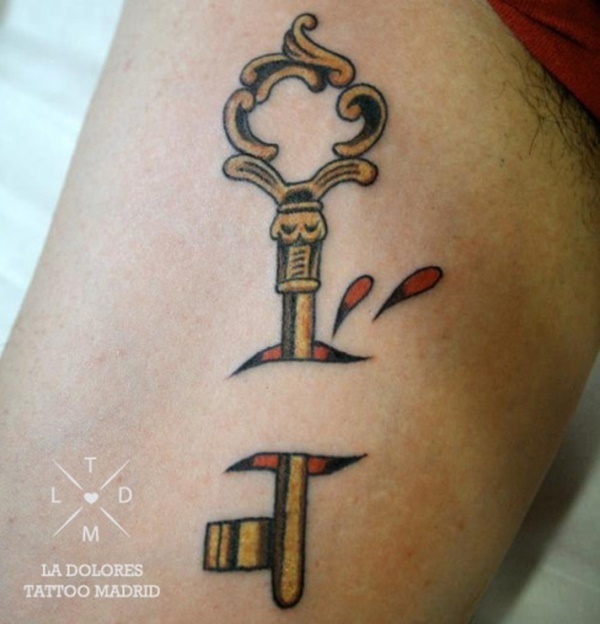 Another traditional piece featuring typical elements: Strong bold colors and heavy lines make this key substantial. A realistic approach to the subject. 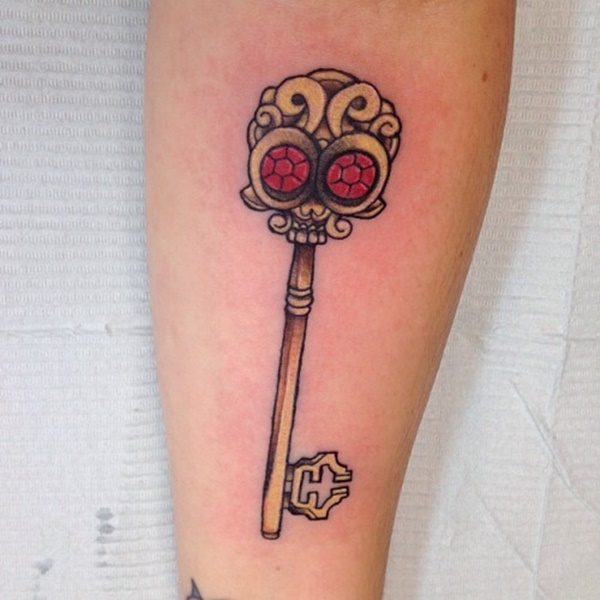 This time the key’s design is taken from modern days. 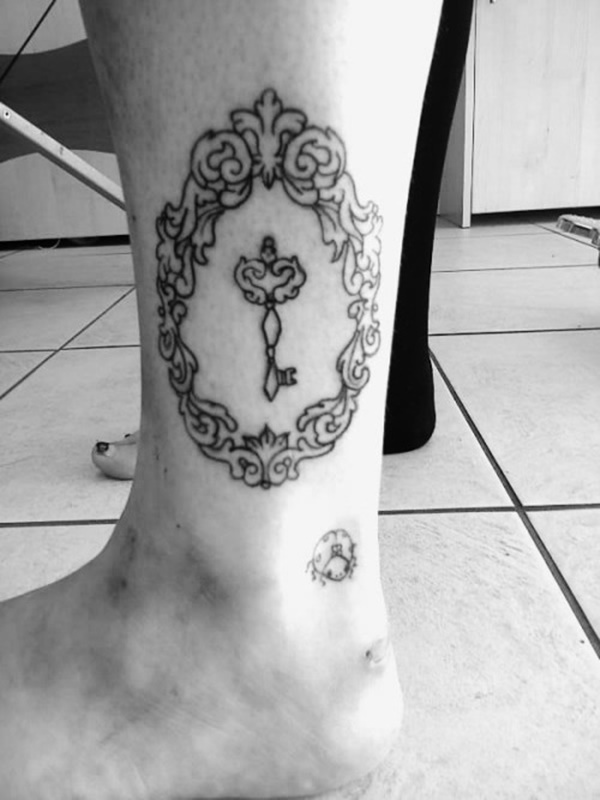 The filigree embellishments frame this key nicely, centering it in the middle, like a portrait painting. No shading, just line work. 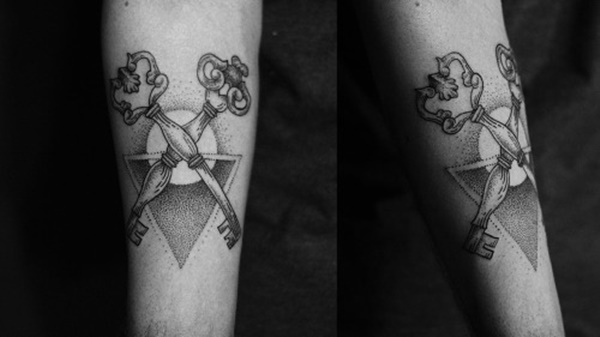 This one features two nautical stars and a negative space house silhouette as the unlocking code. 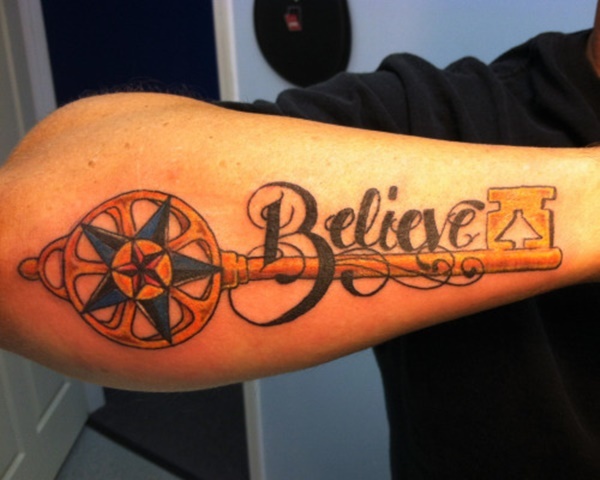 Above the key in beautiful calligraphic letters : “Believe.” The yellow nuances gives it a golden premium look. 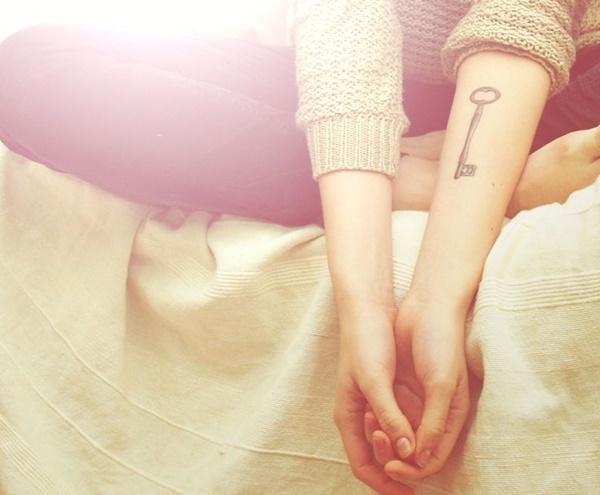 Keys are not just for doors, but for many other object we need locked: a safe, a treasure box, jewelry box, etc. 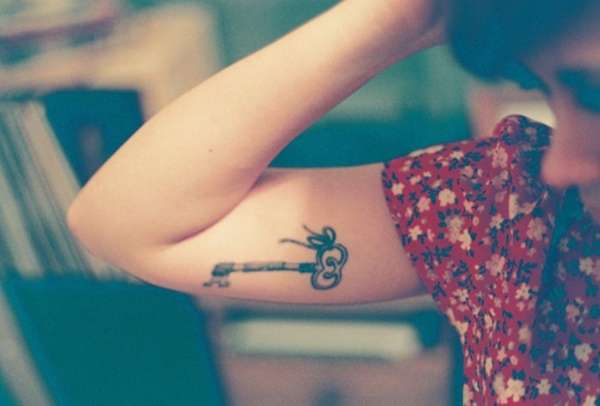 A key can also be used to lock something and keep it hidden and secret. Type here For unknown reasons, this one has been left unfinished. Type here Another messenger bird that brings a key. This time no motion is suggested and no shading is present, just pure saturated black. 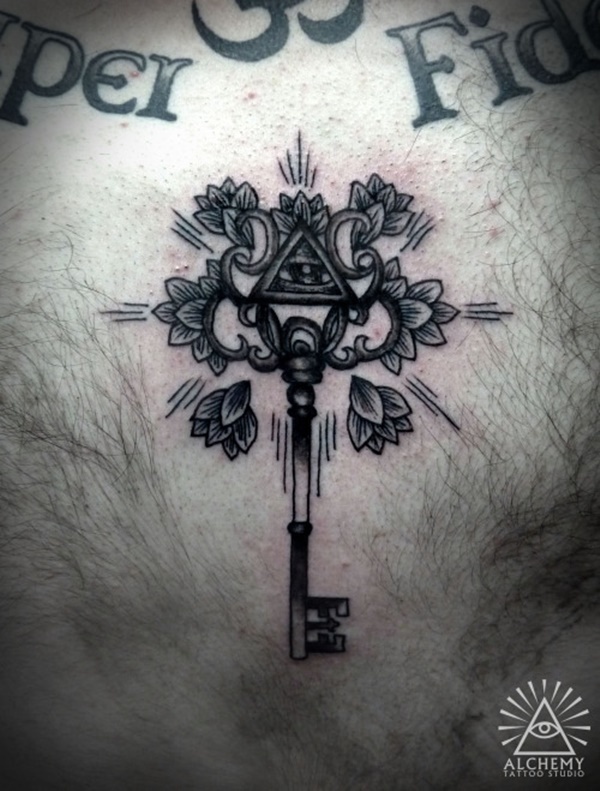 Beautiful gray wash filigrees surround and frame this keyhole tattoo. 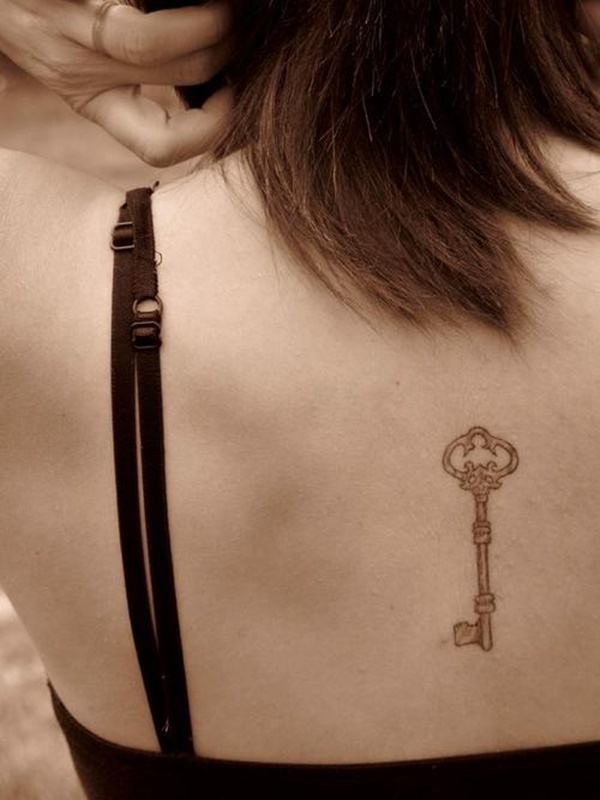 A real key is held suggestively in one hand. It looks that it might fit, doesn’t it? 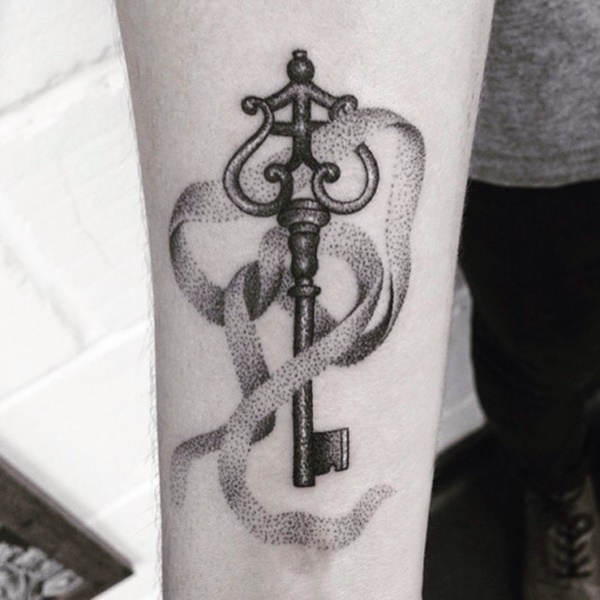 This symbolic tattoo idea can take many paths in terms of meaning and design, although they preserve the general meaning: Unlocking and granting access to something that needs a password. It can be love, time, enlightenment, the soul, the heart, or other concepts. 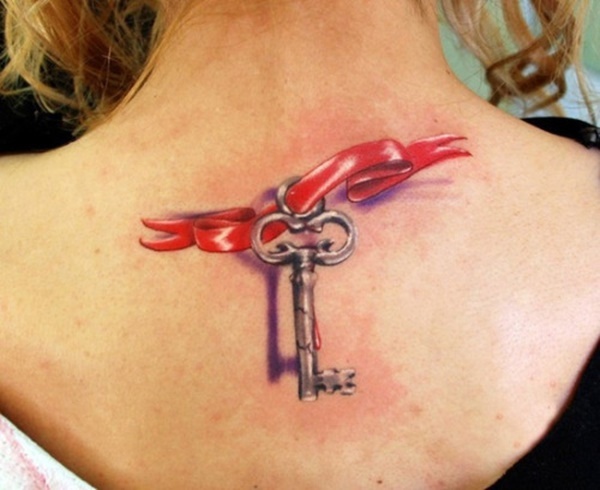 Another classical key and red ribbon, done in a realistic manner. 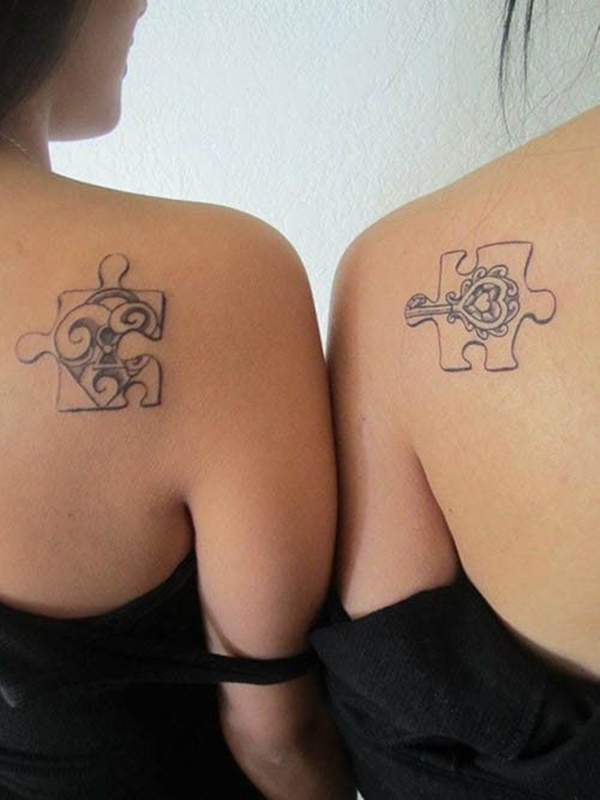 The colored shading lifts them off the skin. 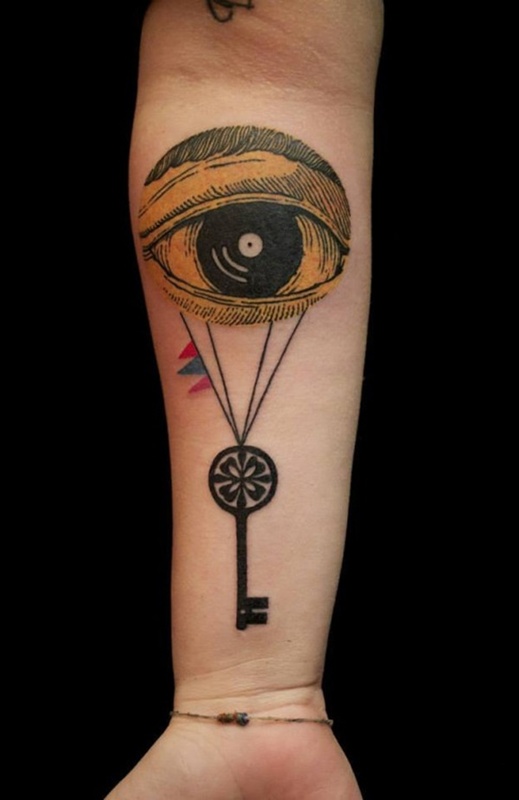 Line work tattoo with the all-seeing eye above. 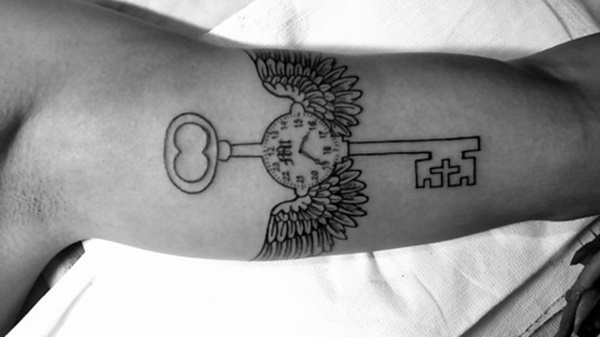 We can easily translate it to “the key to enlightenment.” The surrounding lines suggest light rays. This one goes inside the skin and sheds some blood. 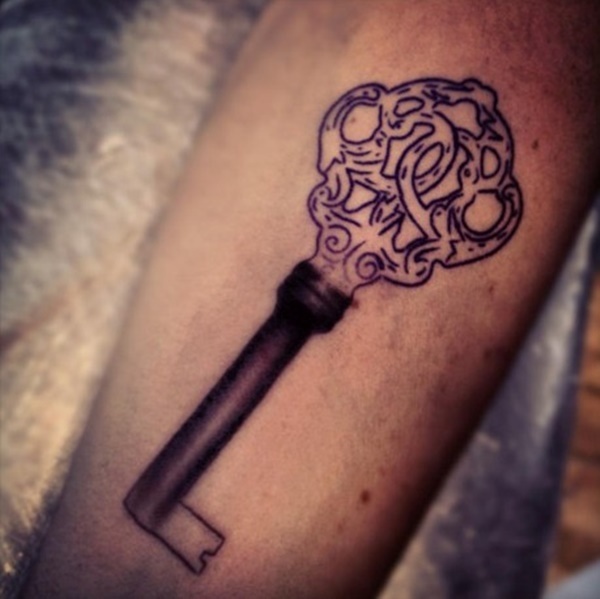 As you’ve noticed so far, there are countless possibilities for a mysterious key design. This catalog is a brief collection of the many styles available out there. You can create a design from scratch, use one of these as a template, or pick one that you like from here. If you have your own original idea in mind, you can get someone to draw it, or illustrate it digitally in a image editor. Even better, you can do it yourself, if you can draw or you have experience in a graphics program. 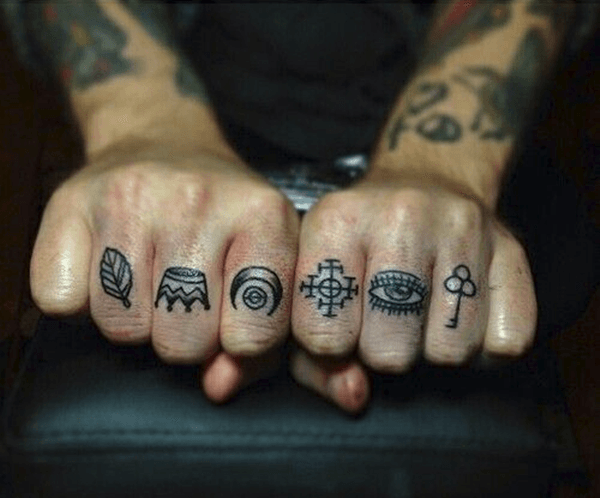 If visuals is not your thing and you have no skilled friends in these fields, collaborate with the tattoo artist and come up with something you both agree upon and feel happy about. 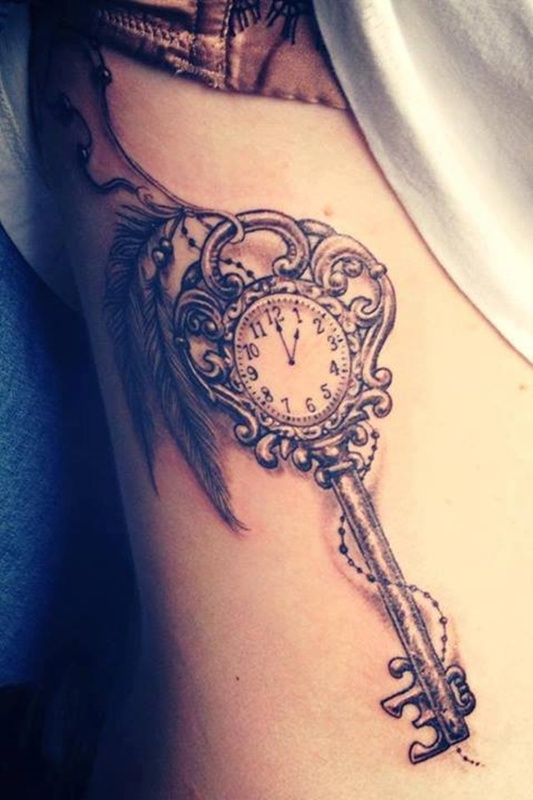 After all, it’s your body and the ink will stay forever on the skin. 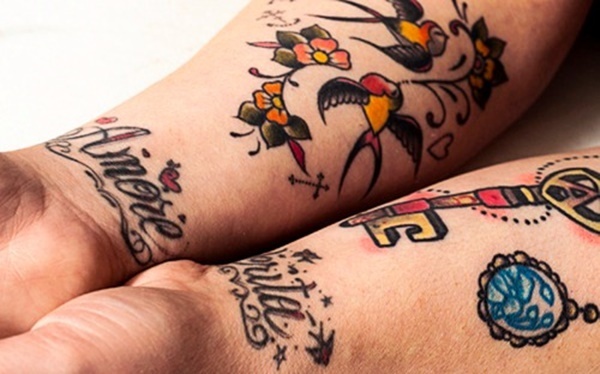 Your tattoo artist should inform you about what would work and what would not, in terms of placement, size, design, aesthetics, and colors, among other factors. A good artist should have positive input on your ideas and take it as far as it can possibly go. He/she should be receptive, and with the help of their imagination, turn your words into a great visual concept. 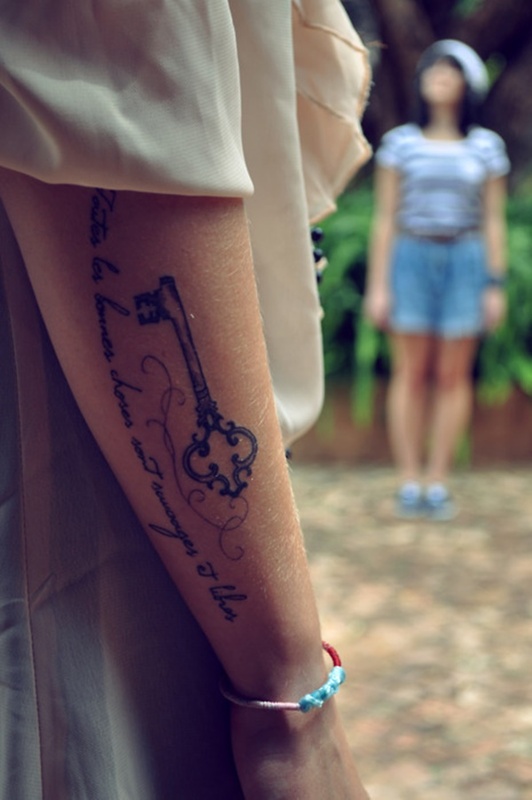 A key that says many things with little “words”. 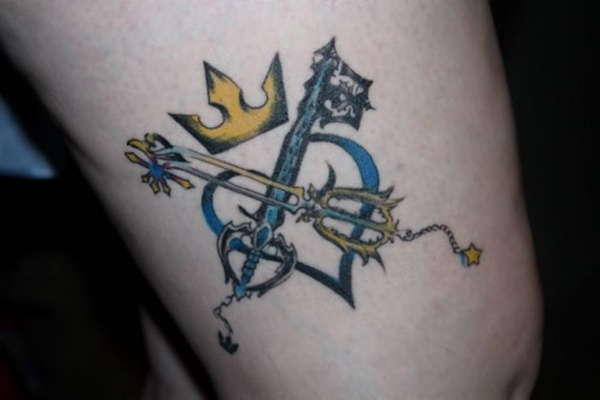 The body resembles Poseidon’s trident and the pins resemble a city on the water. It’s great to get something like this when you’ve been in a city that left a strong impression on you, so strong that you feel your heart belongs there. 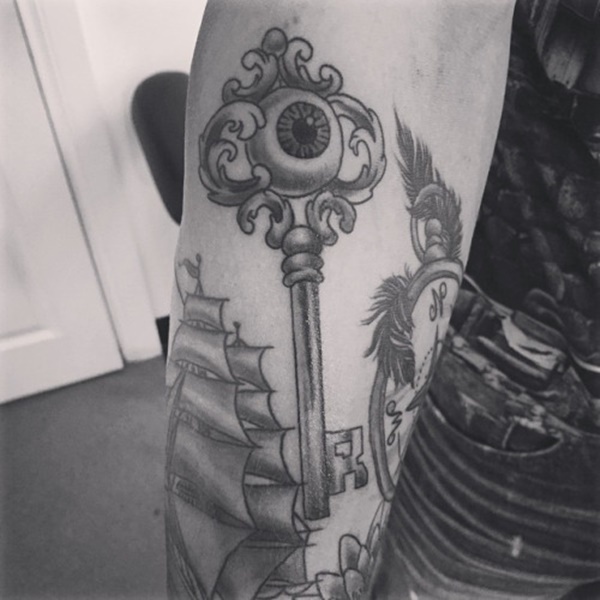 An eye shaped balloon stringed on a key. It seems like it’s floating in the air isn’t it? We can take a wild guess that the eye means higher awareness or elevated vision. The colored triangle flags make it cheerful. 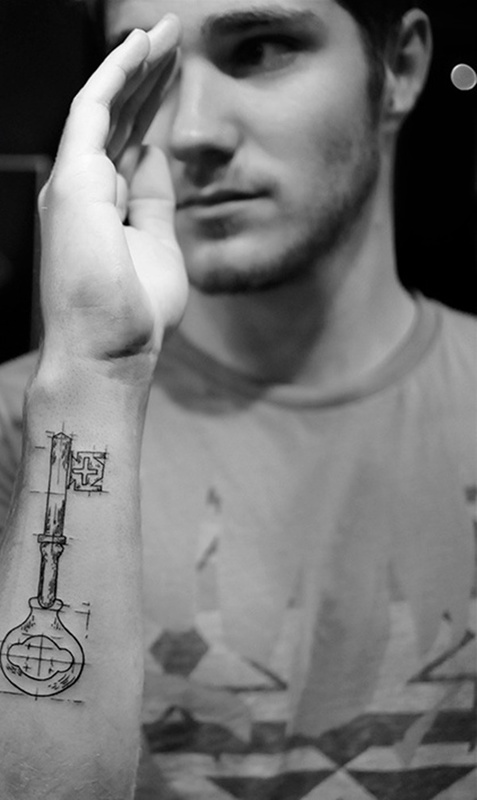 Fore arm placement on a large skin area. 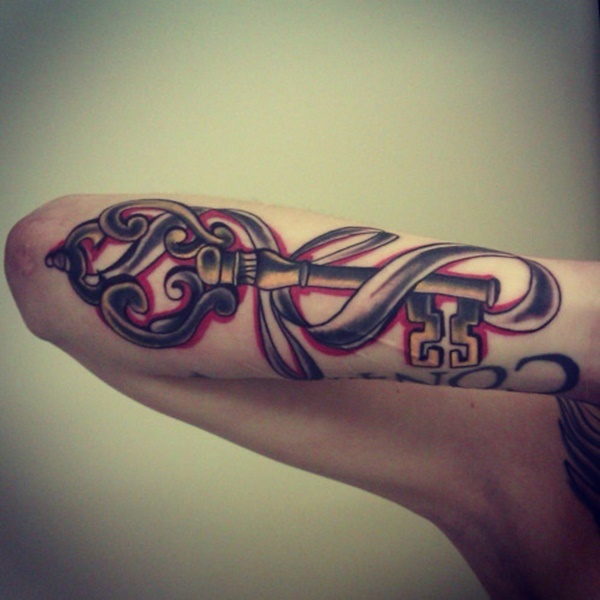 gray shading with color accents and a flowing ribbon in a serpentine around the key’s body. 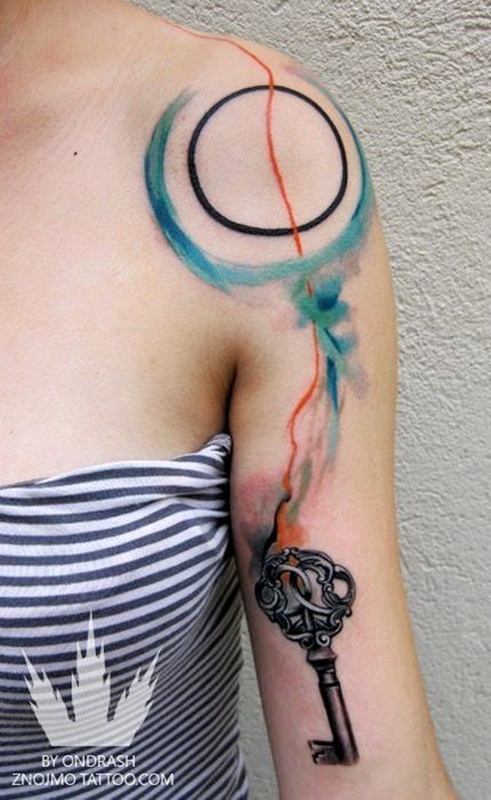 Skull candy tattoo with saturated colors. Colorful skull candy key with orange,pink,and neon green nuances placed on the hip. Only lines and dots. The pointillism creates the impression of shades. The closer the dots are, the darker it looks, the further they are from each other the lighter is the optical impression. 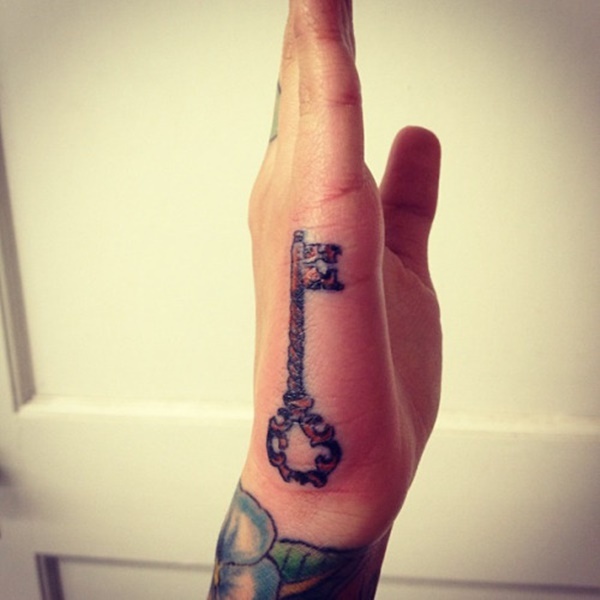 A hand comes out and offers an unlocking answer. Again, line and pointillism technique. 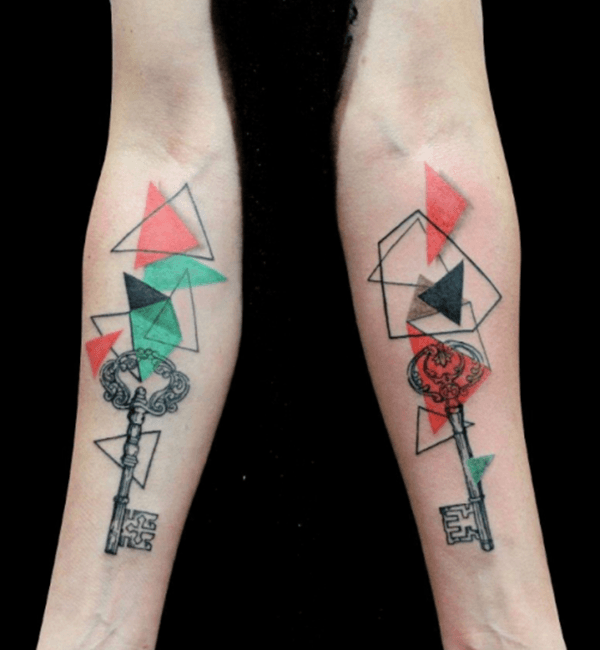 Saturated black, bold lines and a heart with a Celtic knot inside of it. Simple and strong. This one looks like it’s been home made by a scratcher. Blurry, asymmetrical, shaky lines and a poor design. That’s a no-no. 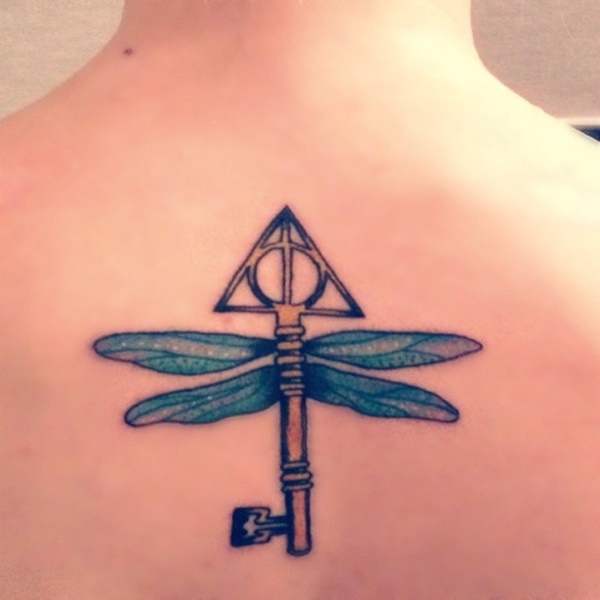 You should always look for a professional tattooist to ink you. 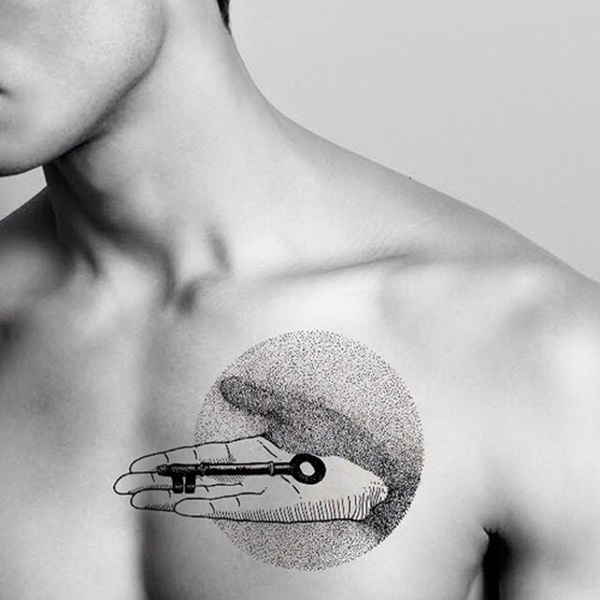 We’ve seen the classical tattoo approach and the customized one. By adding elements you can add or direct the meaning and enrich the design with ornaments. You don’t have to be limited by what you find. Come up with your own elements and ideas. Again we met traditional style. 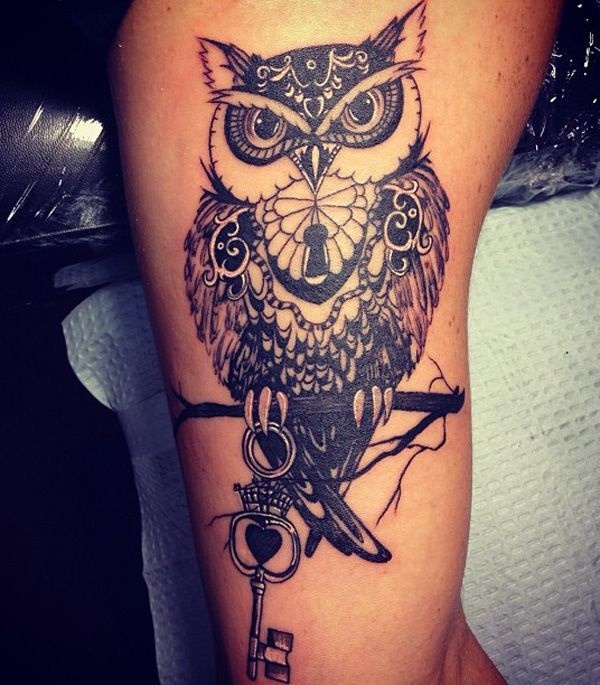 Bold lines, soft shading, filigree patterns and a starring eye inside of them. 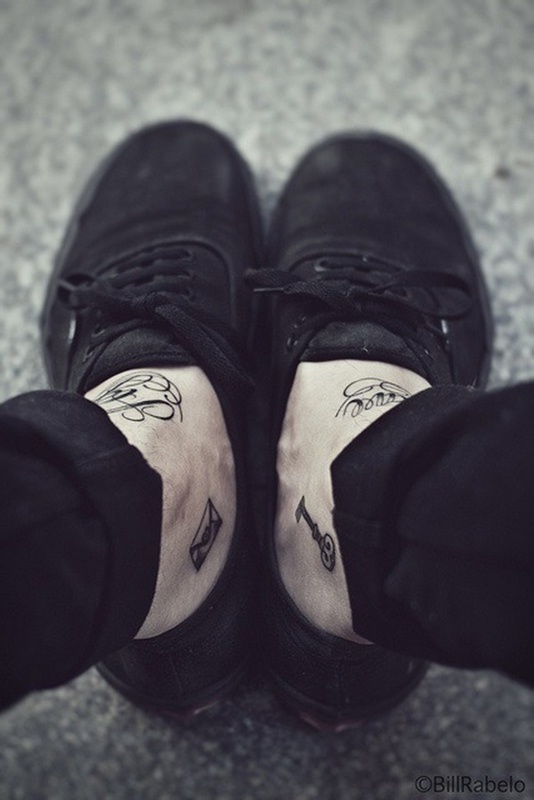 You have seen pictures of various tattooed skin areas, sizes and several examples of traditional, black and gray, realistic, and mixed styles. 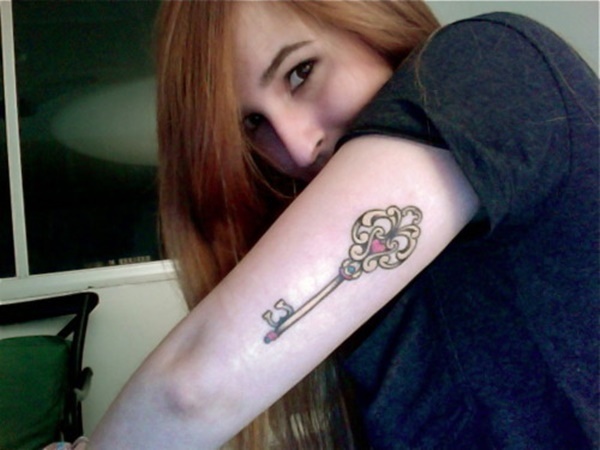 Regardless of the tattoo you want, avoid getting one from scratchers, even if it seems financially advantageous. 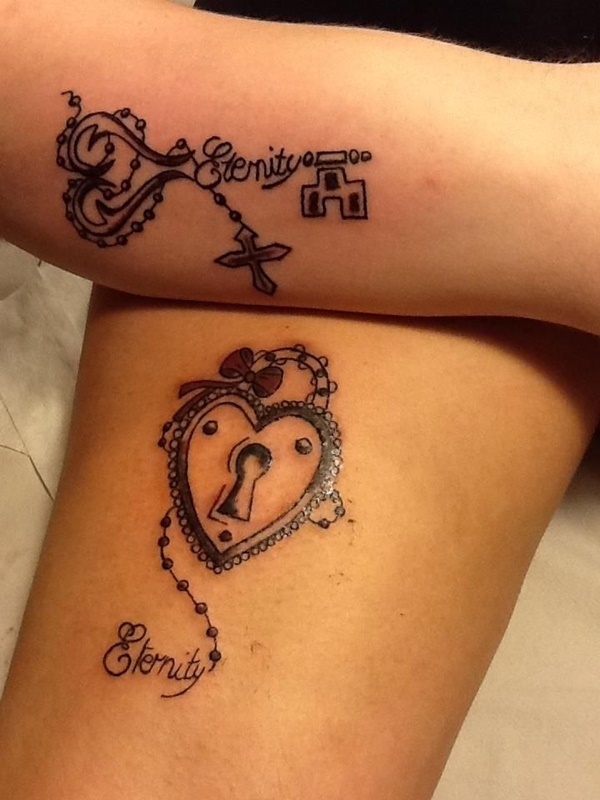 Chances are you’ll end up with a poor design, you risk infections and diseases, your tattoo might not hold properly in time and it’s forever! 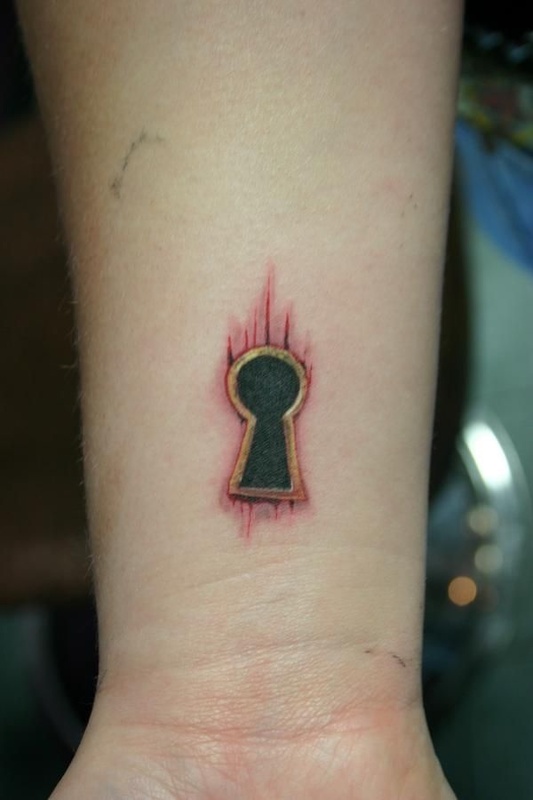 You might end up paying more money to get a cover up from a professional artist. 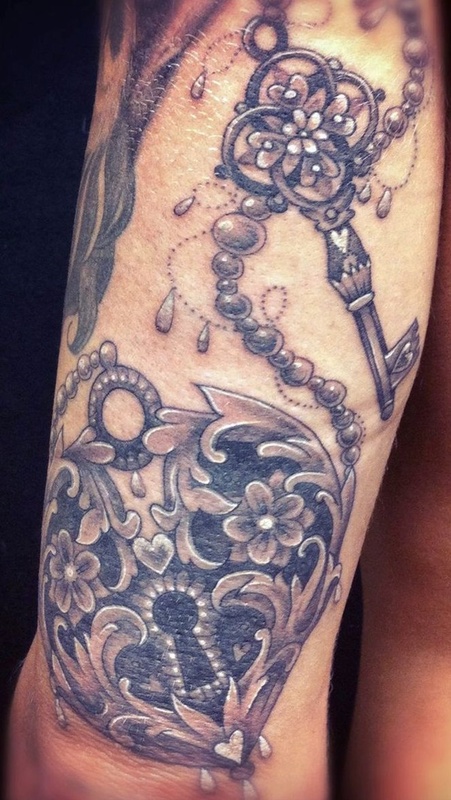 Cover ups are harder to design, limited in possibilities and usually more expensive. 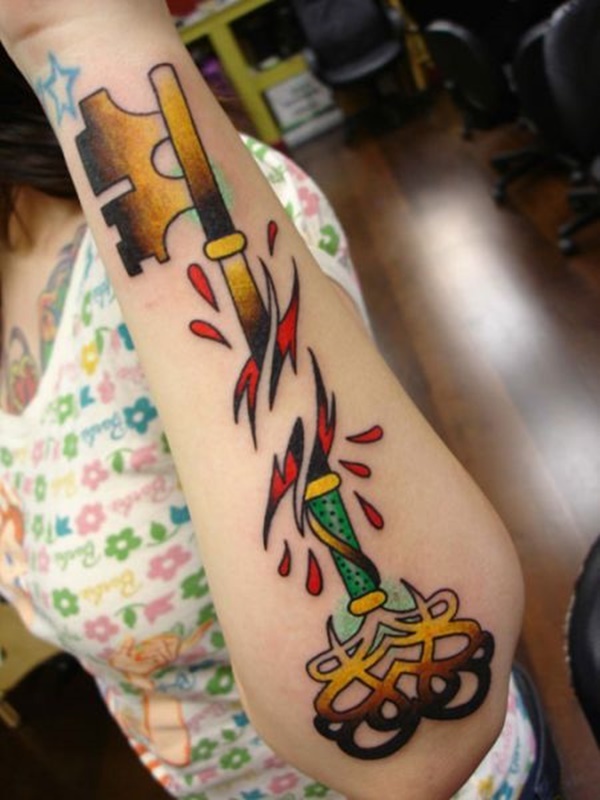 Don’t sacrifice skin for cheap tattoos. 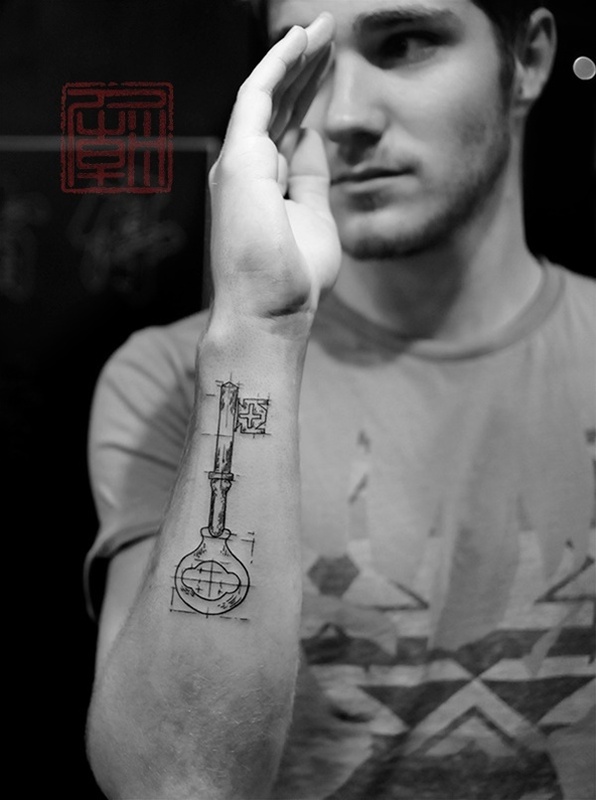 Go to a professional tattoo shop and get your symbolic tattoo the right way.